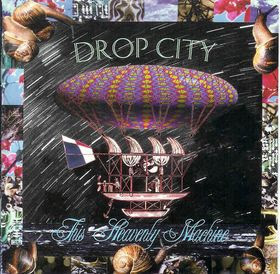 Drop City were a Sydney outfit that existed from 1993 until 2000. In 1996, Fools Rush In was released as a single from their forthcoming album, This Heavenly Machine. They didnt have a filmclip for it, so I recorded them playing at a Festival in Glebe and shot extra footage and made this clip. I gave it to them and they liked it and it became the video. It played extensively on ABC's RAGE and Foxtel's Channel V (Known as RED at the time). Though I never got to meet the band or get a signed cd etc, I'm still glad I did it. If you look closely, I managed to sneak in a couple of shots of myself and yes, I was going through my grunge/hippy phase. The album, This Heavenly Machine. It was a shame to see them split up. Like many Australian bands, had they been American or European, they would have had a lot more success than they had. *Our population is just too small, and the opportunities few.) The album before this one, Magic Transitor Radio was one of my favourite albums of the 1990's. Years later I came across lead singer Matthew Tow who has a new band, The Lovetones, working in a Sydney record store. He served me but I didn't have the heart to tell him that we had a connection. A synopsis and first page from each of my six completed novels. Wow! that was a great song. It's too bad that the market was totally flooded back then, with bands that had that that sound. The video was amazing! You are really talented my friend! That is a very cool video, Anthony. It's artsy and psychedelic like the music. The effects are great. I agree with Pat. You're a very talented videographer and writer.